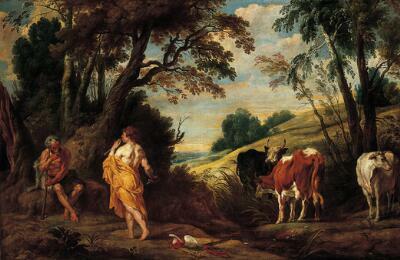 Mercury and Argus, a story of love and deceit, derives from Ovid’s Metamorphoses. Jupiter transforms his paramour, Io, into a white heifer to protect her from his jealous wife, Juno. Upon realizing this, Juno places the heifer under the watch of the giant Argus. Jordaens depicts the tense moment when Mercury, sent by Jupiter to kill Argus, slyly approaches the watchman after lulling him to sleep with his pipe; Io stands placidly by at the right. Two artists collaborated to paint this composition. Jordaens painted the figures, with Jan Wildens painting the landscape. Such collaborations were common in workshops that created paintings for a thriving art market. Indeed, both artists had worked in Peter Paul Rubens’ studio, one of the most productive of the seventeenth century. Possibly Jaques de Roore (sale, The Hague, 4 September 1747, no. 79). Brought to Ireland from Antwerp by Major Whitlock.